Do the soaring temperatures day by day making you realize that summers this year will be harsh and hotter ?? Is the weather tricking you to compromise on high street’s seasonal offerings and trends ?? Is your searching for the perfect flat summer sandals turning into a nightmare ?? Come on sunshine, we’re ready for you! We are sure, these designs must have left you drooling, still we want to let you know that this collection features a leather upper, an adjustable buckel and a man-made sole....So, you need not even doubt about the comfort which these pairs bring to your feet !! You will simply fall in love with the details on each pair in form of rhinestone, studs or glitter which are low effort and high impact. So you are ready to wear your amazing Steve Madden for a long shopping trip ?? Sandals from this collection are perfect to wear to work with your office dressing. For a weekend look, pair them with shorts and a tee. Carry a crossbody bag for a finished look. Ballerinas are perfect wear for this season. Going by season current trends of studs and minimalism pair these ballerinas with any outfit , whether a pair of shorts for the day or a skater dress for the night to add a pop of color . Statement shoes are a favorite with the fashionistas. Pair them with a monochrome outfit and let your feet grab all the attention. Give your heels a miss with these gorgeous flats. Pair them with dresses, shorts or even your office attire for a comfortable yet stylish look. Now you can buy your fav Steve Maddens online with great offers and discounts too !! Me encantan las de la primera foto!! son ideales!!! las quiero!! great diy inspiration! love these! i love steve madden shoes! I love all the metallic details on the shoes. omg wish I could buy all of these shoes!! I'm loving the spiked sandals! I much prefer wearing flats, the bright orange pair is fabulous! Wow! Can't tell which pair is more beautifull! Muy bonitas todas las sandalias!! Besos. The first one is my fav ! I have an international clothing giveaway on my blog,hope you can participate! Love the shoes dear! If only it would stay warm for longer than a day! Thanks for the invite on lookbook. I fanned you! I like your blog too. Please visit my blog too if you like. 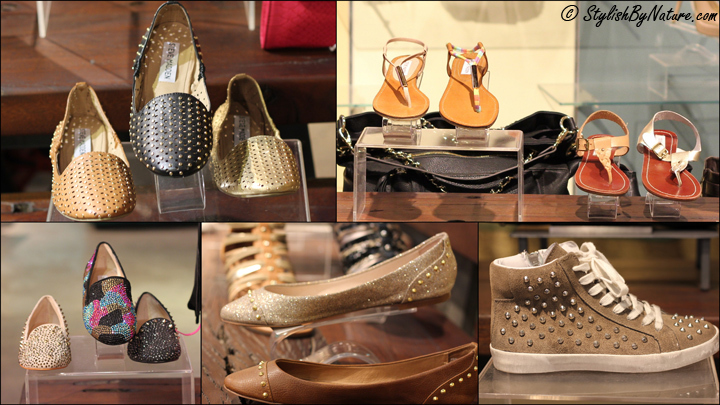 Wow!Am drooling the orange studded flats! i can't wear heels and it is hard to come by stylish flats..my heart skipped a beat at how great these look! I cant stop ogling at the flats <3 Where is it in Bangalore? Really love sandals ! Work,beach,and very very comfortable for the feet ! great post! first pair definitely my favorite, love them for summer!